On Thursday, SF Planning will hold a public hearing on a proposal for a new mixed-use building at 600 Van Ness Ave.
SF Planning Commission staff are recommending approval of a plan to erect a 130-foot-tall building at the former McDonald's location on Golden Gate and Van Ness, despite its failure to meet some zoning restrictions. According to the most recent documents filed with SF Planning, Golden Gate Van Ness, LLC, plans a 12-story building with a higher-level penthouse; 6,200 square feet of ground-level retail along Golden Gate and Van Ness avenues; on-site, below-grade parking for residents; more than 180 bike parking spots; and about 8,782 square feet of open space, 3,800 of which will be private terraces. The remainder will be common open space for tenants. The two-story housing on Elm Street is intended to increase sidewalk traffic, with stoops for each dwelling. 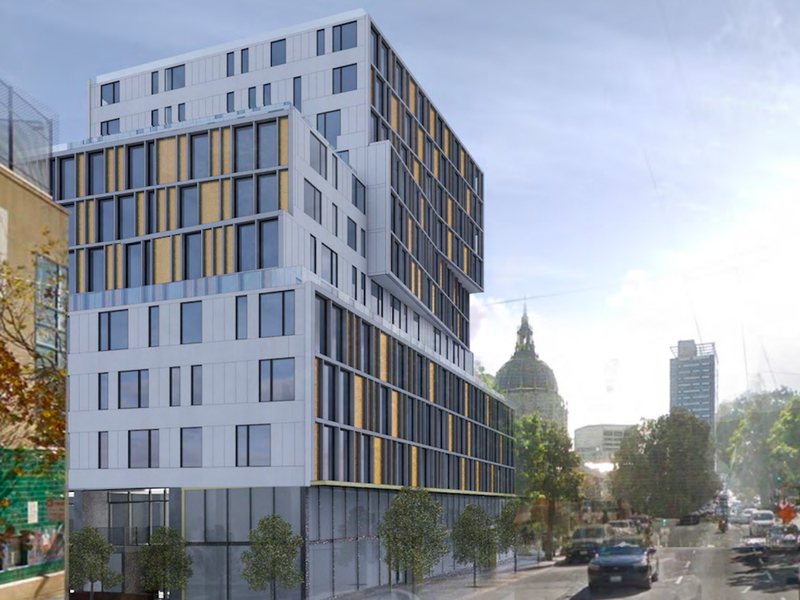 There will be "two levels of 16 units overlooking Elm Street, providing 'eyes on the street,'" 600 Van Ness Golden Gate LLC representative Tenny Tsai told us. The project will add 168 residential units to the neighborhood: 78 studios, 54 one-bedrooms, 31 two-bedrooms, and one three-bedroom. The project's tallest point will be its penthouse, at over 138 feet tall, while the frontage along Van Ness and Golden Gate would be 128 feet tall, stepping down to 81 feet on Golden Gate, and to 51 then 22 feet tall on the eastern portion of the Elm Street side. The building's massing will result in a stacked look, with taller floors set back from street frontage. All of the units on the site will be rentals. 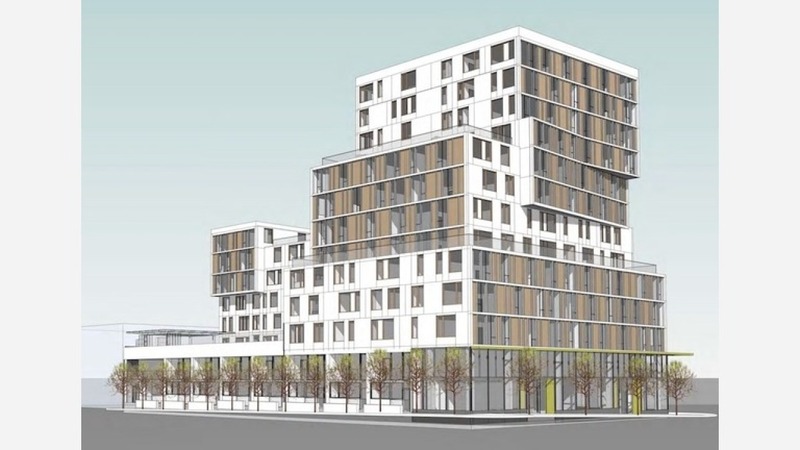 The current intention is to meet the city's affordable housing requirements on-site, with 11 studios, eight one-bedroom, and five two-bedroom rental units, or 14.5 percent below-market-rate, Tsai said. The project includes plans to erect a perforated metal and glass awning above the retail spaces on Van Ness, and to extend the second and third stories three feet into the space above the public right-of-way on Golden Gate Avenue. 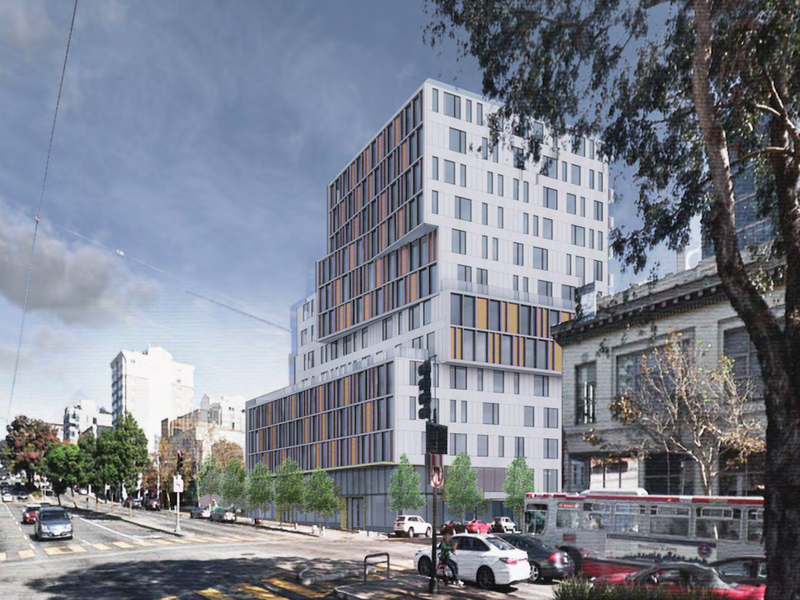 While these plans do not conform with the planning code's "list of permitted obstructions," the developer is seeking an exemption to "advance the architectural form of the building and integrate the contorted/stacked massing," according to SF Planning. Looking south towards 600 Van Ness and City Hall. 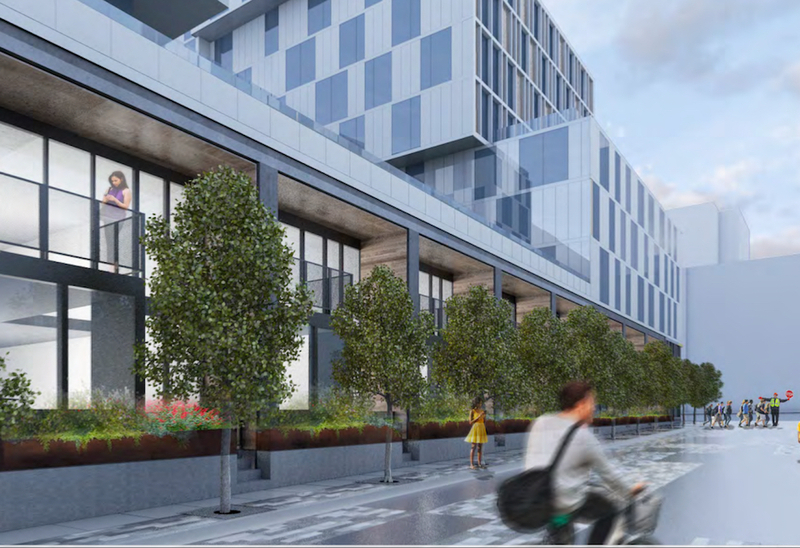 The developer is also proposing a streetscape plan surrounding the project that includes sidewalk bulb-outs, new street trees, residential stoops, and a raised crosswalk on Elm Street which is closest to the Tenderloin Community Elementary School. The property owner has already agreed to reduce the site's possible massing by 20 percent, and split the development into two wings to preserve a view of City Hall's dome from the elementary school, according to SF Planning. As we reported last year, the old McDonald's was demolished in January 2017 to make space for Walsh Construction to use the site as a staging area as it works on the Van Ness Bus Rapid Transit project. Anyone interested in learning more about the project can tune into SFGov TV for the Planning Commission meeting on Thursday, March 22nd at 1:00pm or attend the hearing in Room 400 at City Hall.